Sigstr is a cloud-based email signature marketing solution which dynamically inserts clickable call-to-action banners within email signatures. The software can be used by account based marketers, event marketers, content marketers, brand marketers, and more. Sigstr allows users to deliver personalized content to recipients along with a clickable call-to-action, with users able to track clicks and recipient engagement with campaigns. Signatures can be updated across the company in real-time through the WYSIWYG editor, and personalized for each employee with their names and job titles. Overall, it is a pretty good up and coming tool with a user-friendly interface. It still has areas of growth and improvement, but it adds value internally and externally for a decent price. The signature we have with Sigstr is definitely better than the previous “everyone create their own”. We look more uniform now and the addition of our pictures helps the recipient feel more comfortable with a face to the name. Signatures can be assigned to different groups within the company and the fields in the signature can also be company fields or individual fields. So if you want the Sales Team only to have a signature with their personal LinkedIn, but the company’s Facebook page, that can easily done. Being someone who prefers Adobe Suites, being able to design my banner however I want and just upload it is very convenient for me. Once created, you can decide if it’s an internal/external campaign and/or assign banners to specific HubSpot lists. Once the campaign is live, you can see who clicked on the banner, how many times and how the campaign is doing via the click rate. Sigstr is also adding carousel banners with the ability to assign different links to each banner which is pretty cool. The customer service at Sigstr is pretty good as well. They would fix any bugs we found quickly and helped us build our original signature. Since then, employees at Sigstr have kept in touch and even stopped into our office once when they were in town to get our feedback. The signature we have with Sigstr is definitely better than the previous “everyone create their own”. We look more uniform now and the addition of our pictures helps the recipient feel more comfortable with a face to the name. Signatures can be assigned to different groups within the company and the fields in the signature can also be company fields or individual fields. So if you want the Sales Team only to have a signature with their personal LinkedIn, but the company’s Facebook page, that can easily done. Being someone who prefers Adobe Suites, being able to design my banner however I want and just upload it is very convenient for me. Once created, you can decide if it’s an internal/external campaign and/or assign banners to specific HubSpot lists. Once the campaign is live, you can see who clicked on the banner, how many times and how the campaign is doing via the click rate. Sigstr is also adding carousel banners with the ability to assign different links to each banner which is pretty cool. The customer service at Sigstr is pretty good as well. They would fix any bugs we found quickly and helped us build our original signature. Since then, employees at Sigstr have kept in touch and even stopped into our office once when they were in town to get our feedback. I will say in setting up our signatures, we had a few bugs (which Sigstr quickly resolved) and coding set backs because I cannot code (coding is only required the fancier your signature gets). But once your signature is done, you don’t need any more coding. Also, someone who doesn’t have Photoshop or Bannersnack skills, might have trouble designing/updating the banners frequently. However, Sigstr is adding an in-platform banner creation option sometime in the future. In addition to helping us achieve brand alignment in our email channel, Sigstr has provided a new channel for content distribution and brand awareness. The platform itself is pretty intuitive and straight forward, the UI is user-friendly. It's easy to add new employees and create campaigns. A game changer for us is the ability to leverage the campaign scheduler feature, which allows us to plan a series of campaigns in advance, get the creative in place and schedule campaigns back to back. This helps us stay on top of our programs and ensure nothing slips through the cracks. Lastly, the Sigstr team is truly great. The level of support and commitment to customer excellence is world class. There are a few bugs that need to get resolved and additional functionality that needs to be developed. I believe some of this is already in progress: -Can't exclude internal clicks from campaign performance, skews data. -Campaign creative is set to permanently display by default. This means that even if a campaign is no longer live the creative will still display for members who are not part of any active campaigns. The workaround is to manually opt out. -No ability to easily select/deselect groups in campaigns. Once you add a group to a campaign there is no easy way to remove. The workaround is to add that group to a different campaign. Our overall experience has been very positive, mainly because of the incredible customer service by Sigstr. Every question is answered promptly. Their team isn't just there to help you if you run into a problem, they are also there to make sure you're getting the most out of Sigstr. For example, they noticed we hadn't changed up our campaigns in a while so they helped me brainstorm some new ones. Their customer support and success teams help you with every step of the implementation process and check in with you periodically to make sure you're getting the most out of their product. They really care about their customers.This software is amazing! I cannot say enough good things about it. It is easy to use and the customer service is second to none. As the administrator, I have the ability to control all of the email signatures for my organization in one place. Before Sigstr we were having an issue with keeping everyone's signature on brand and now its the same across the board. We love having the ability to assign different campaigns for each team to better target prospects. It has also served as a great tool to get information out to prospects and current customers. We were able to standardize our email footers, as well as introduce campaigns into them seamlessly. Intuitive system, easy to ramp up and immediately effective. We recently added the Salesforce integration to our account as well, and this has elevated our ability to target prospects and customers more effectively than ever. We have been using the Sigstr app for 2 years before we got the Salesforce integration app, and I was already very pleased with the results. Daily visits and re-directs to our website or any other landing page that we are promoting at the time.We love using Sigstr here at work. The account reps are easy to work with and very accommodating to work with. The support is A+ as well as any sales personnel we have worked with. The new functionality and options they continue to roll out is great as well. Always changing to keep up with trends and times. Grow: $200/month for up to 50 employees. Standard: from $250/month for 50 employees. Advanced: from $350/month for 50 employees. Professional: from $500/month for 50 employees. 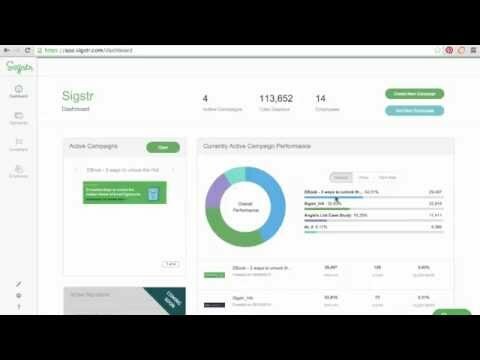 How does Sigstr compare with other Marketing apps? Sigstr is easy to use and gives me a great way to capitalize on emails I'm already sending. Customize signature blocks for each team or individual that can be controlled by a central team / department. Sigstr provides a useful field into our Salesforce CRM, essentially scoring the relationship with a prospect based on previous email / calendar communications. It's super easy to keep signature lines up to date with promotions, events and such across your entire company. No need to ask every individual to make these updates on their own. Justifying cost relative to explicit value. I love it all. I use Outlook 2013 and it even works with that. Would love more insight into the scores -- what exact factors makes a high/low score? Signatures can be updated in real time using the WYSIWYG signature editor. Personalized, employee-specific signatures can be created with individuals’ names and job titles, and formatted to match brand standards. Unique campaigns can be assigned by location or department to target content at the correct contacts. Users can track recipient engagement with Sigstr campaigns, with built-in click tracking. Account-based marketing features allow marketers to utilize employee emails to provide 1:1 targeted content to specific regions, industries, and accounts. Below are some frequently asked questions for Sigstr. Q. What type of pricing plans does Sigstr offer? Q. Who are the typical users of Sigstr? Q. What languages does Sigstr support? Q. Does Sigstr support mobile devices? Q. Does Sigstr offer an API? No, Sigstr does not have an API available. Q. What other apps does Sigstr integrate with? Q. What level of support does Sigstr offer?